Cut a cross halfway into the top of each tomato and place them in an oven dish. Stuff the tomatoes with bay leaves, thyme and garlic. Sprinkle balsamic vinegar and olive oil, some sugar, coarse sea salt and some freshly ground black pepper onto the tomatoes. Place in the oven for 10-15 minutes or until warm and soft, yet somewhat firm to the touch. 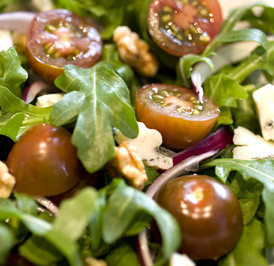 Remove the bay leaves and the thyme from the tomatoes, serve warm, with some mixed leaf greens. Add 1 tbsp of Balsamic vinegar and 2 tbsp of olive oil to the juice in the oven dish, and you will have a fantastic dressing for your green salad.